This may seem like an obvious answer but it does need mentioning. Taking your own pictures lends credibility to your website and you will be able to get the exact image you require. With the amazing picture quality of cell-phone cameras and the abundance of great editing software, getting the perfect image is a lot simpler than it used to be. You are free to remix and adapt the work, use it for commercial purposes and attribution to the site or image creator is not required. You are NOT free to sell, license, sublicense, rent, transfer or distribute this image exactly as it is without alteration and you may not claim ownership of the image. We love Morgue File and use many of their images as the base of our memes. It is always a great idea that if you are going to use the unaltered image on your website, to just give them a shout out or show them some link love. I know what you are thinking, so allow me to elaborate. 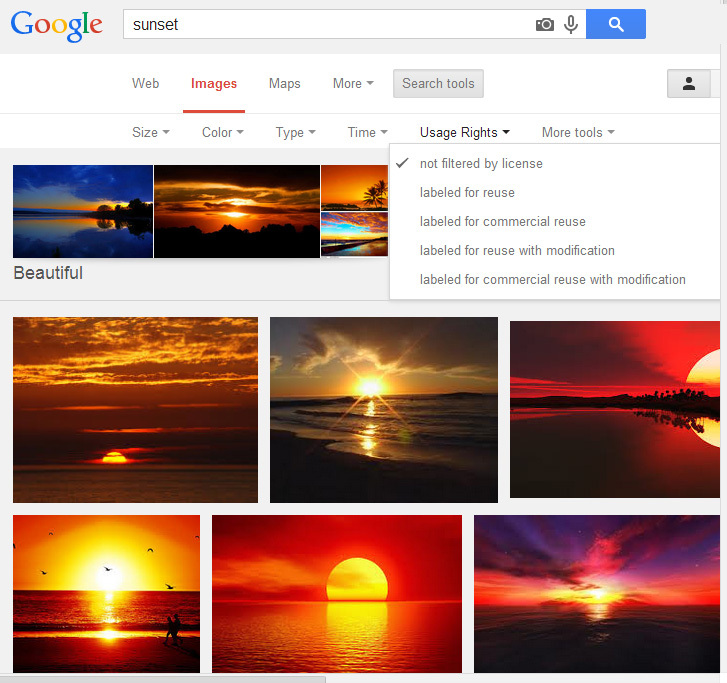 We told you how just googling images and saving them is wrong, but google has now added a really awesome filter to their search tools. When searching google images, you can now search by usage rights.This means that you can filter the results so that only images that are free to be used are displayed. Isn’t that awesome? Now you don’t have to second guess or spend hours sifting through the results searching for an image that you are allowed to use. Simply type in the subject you are searching for and hit the images tab. All the results will come up. Now click on “search tools” and hover over “usage rights.” Then filter all the results by the usage rights you require as simple as that. Sometimes you just really need an image that you cannot create yourself. There are plenty of sites that sell stock photos and graphics including Shutterstock, Fotolia, Depositphoto, 123RF, iStockphoto and Getty Images to name a few. Some sites offer membership programmes where you purchase credits, while others simply charge you per image. So there are quite a few avenues you can choose when searching for images. We hope this helps you get that perfect image for your website or blog. Do you have any other options or favourite websites that offer free images? Let us know and we will try add them to the list. ← Are you investing in your own website?